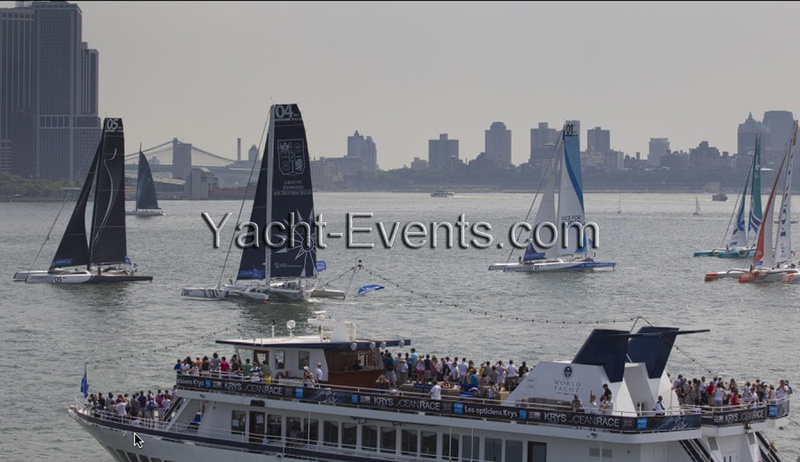 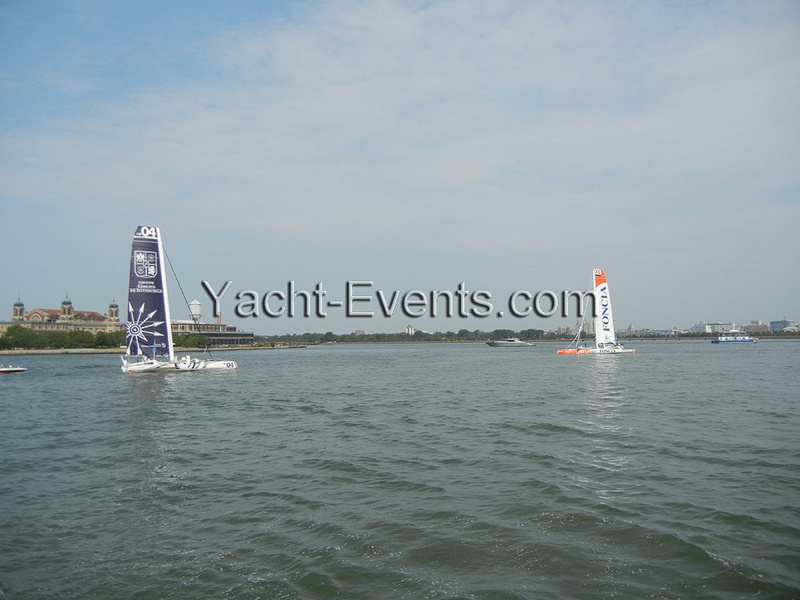 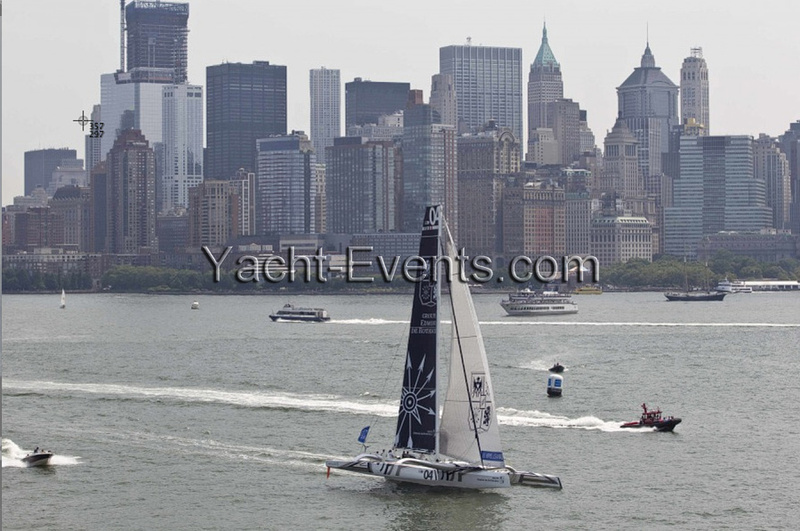 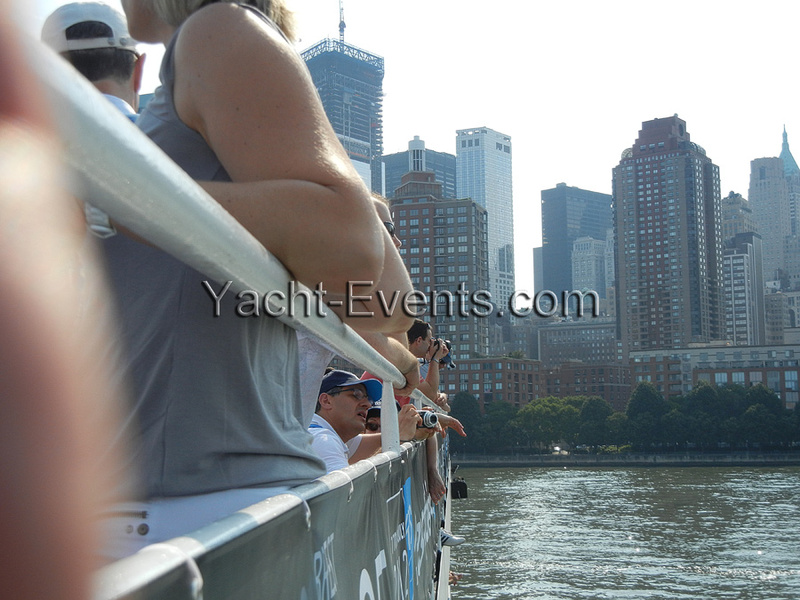 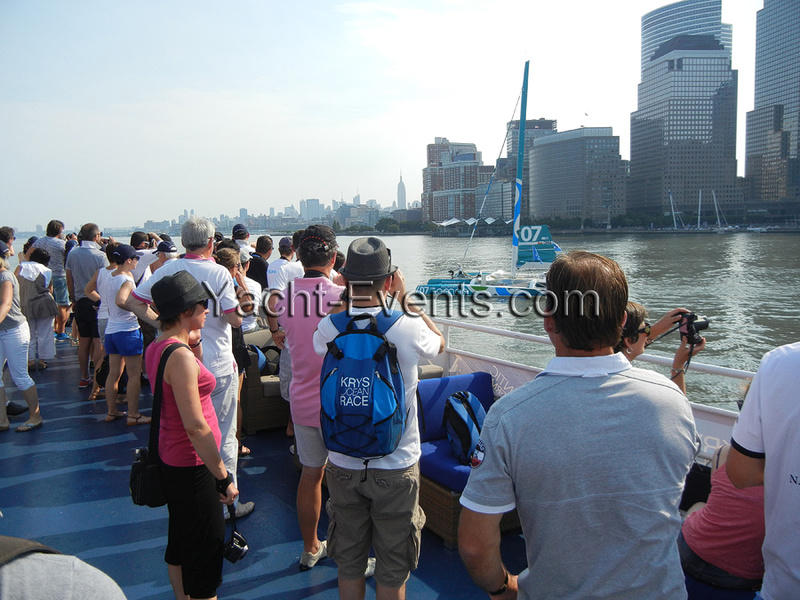 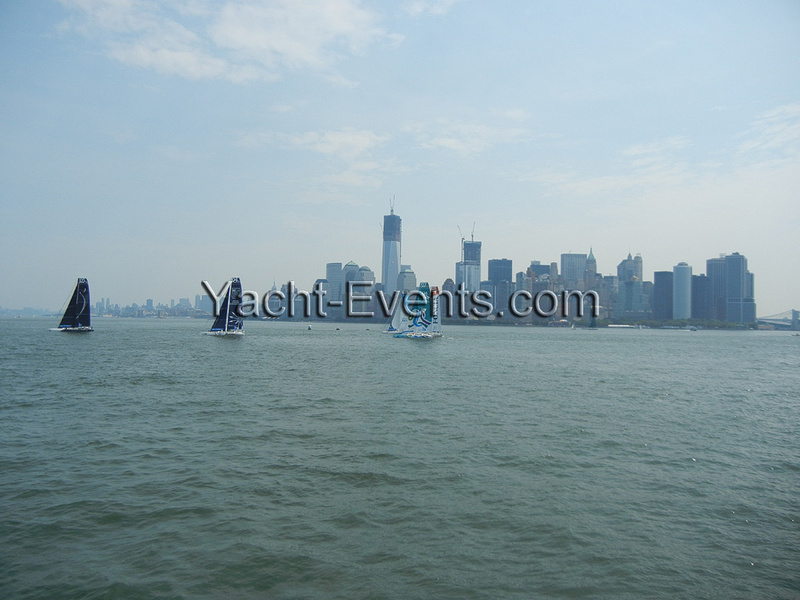 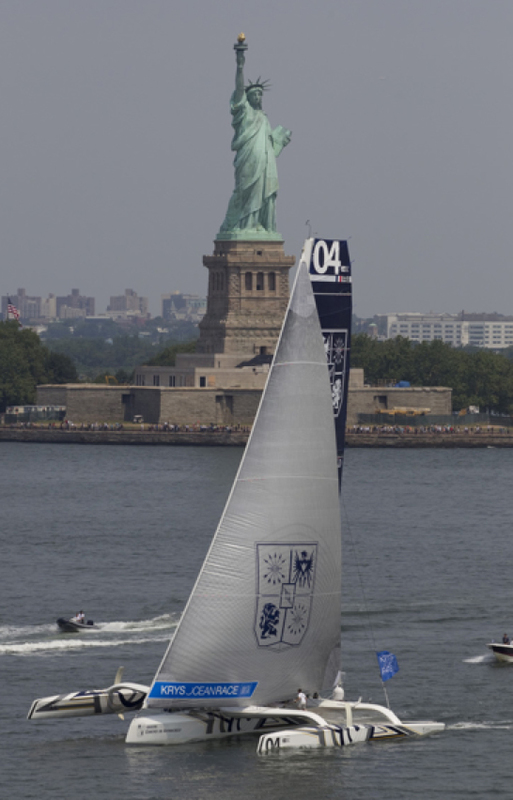 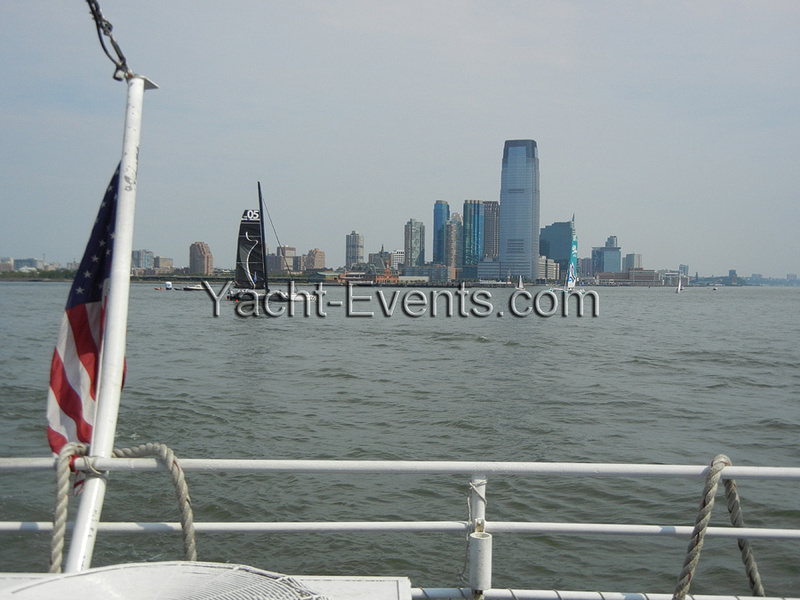 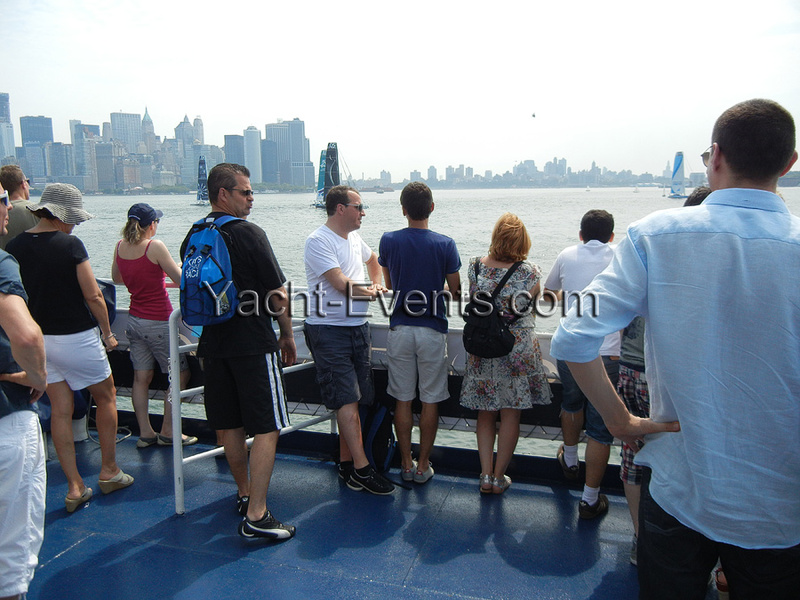 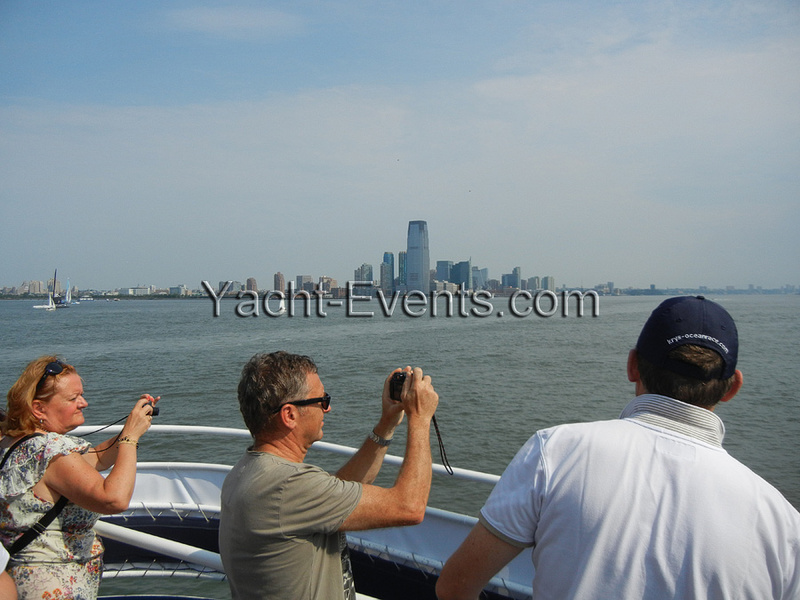 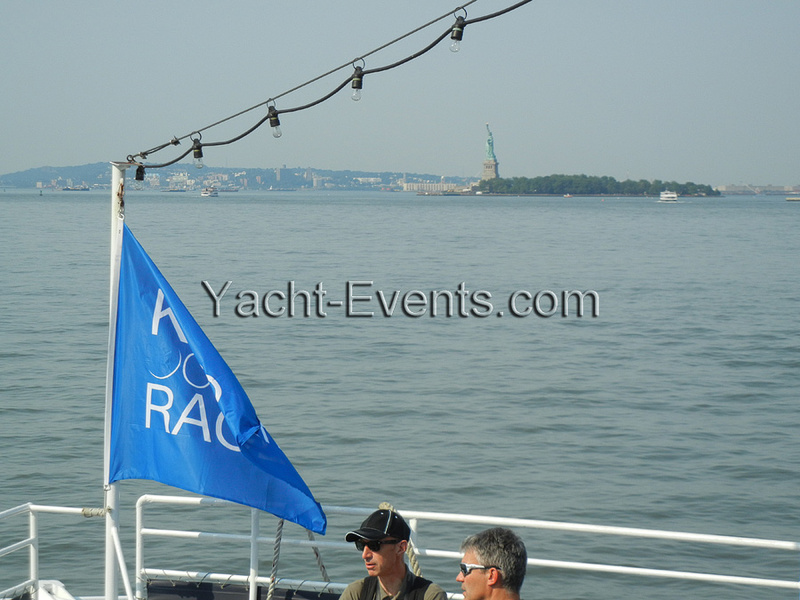 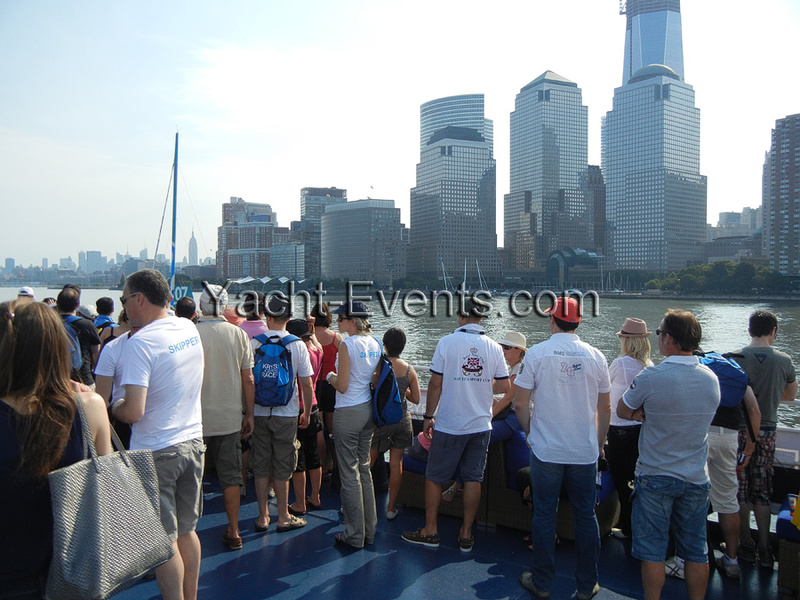 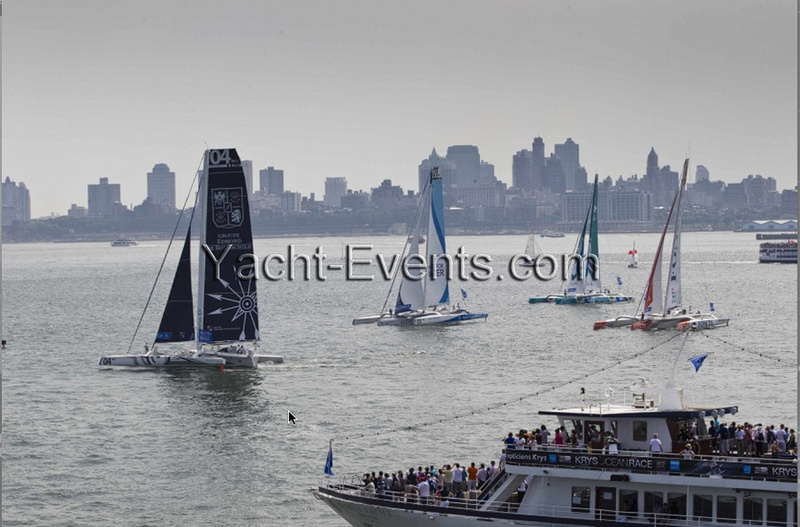 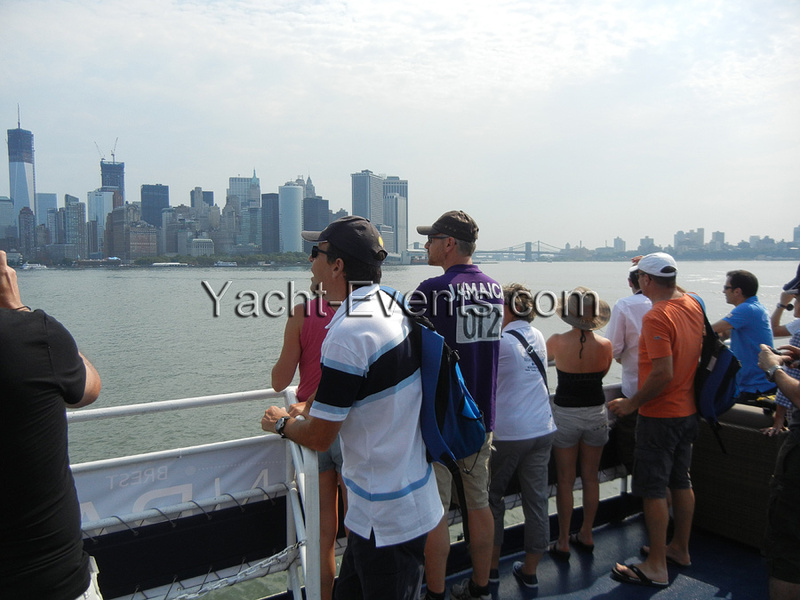 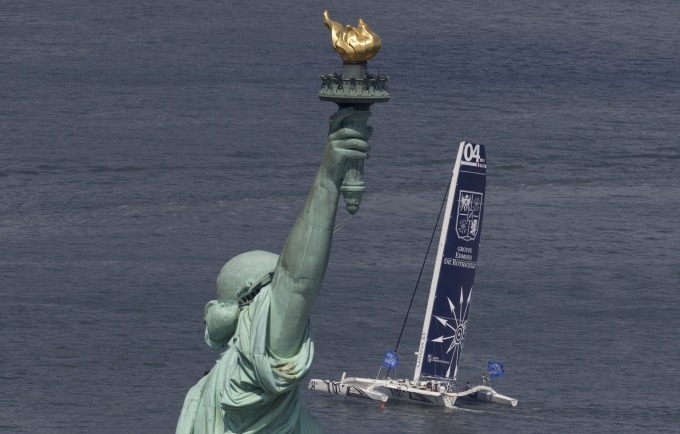 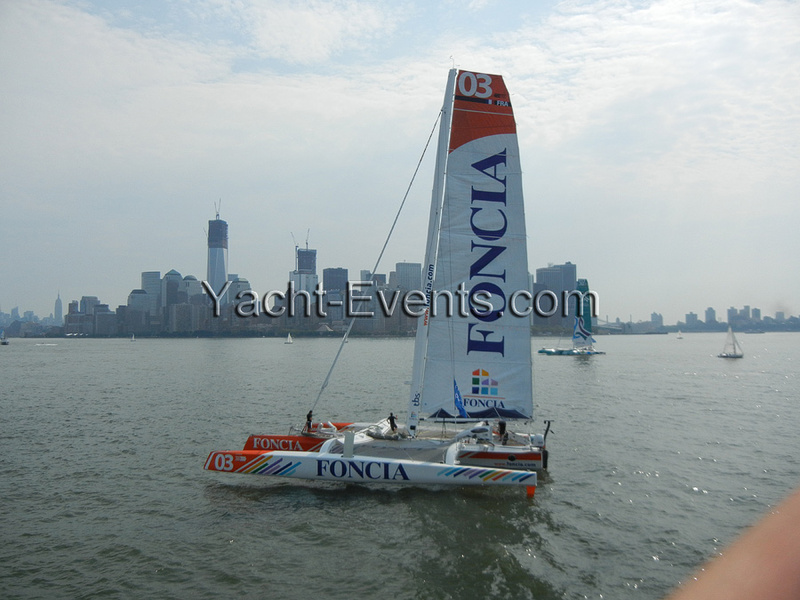 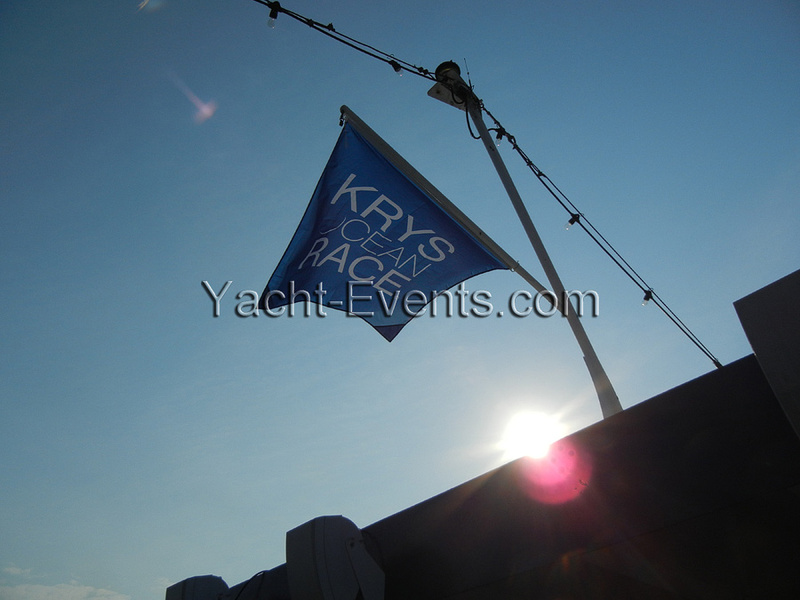 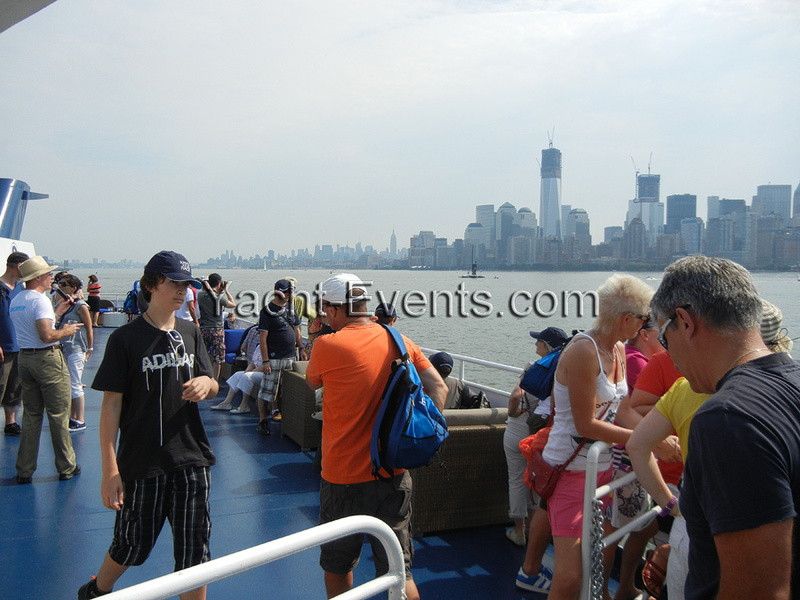 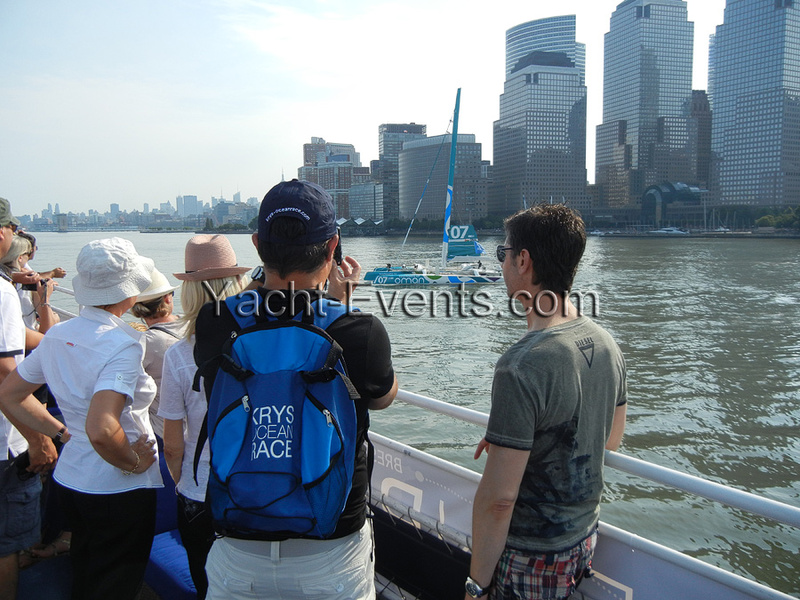 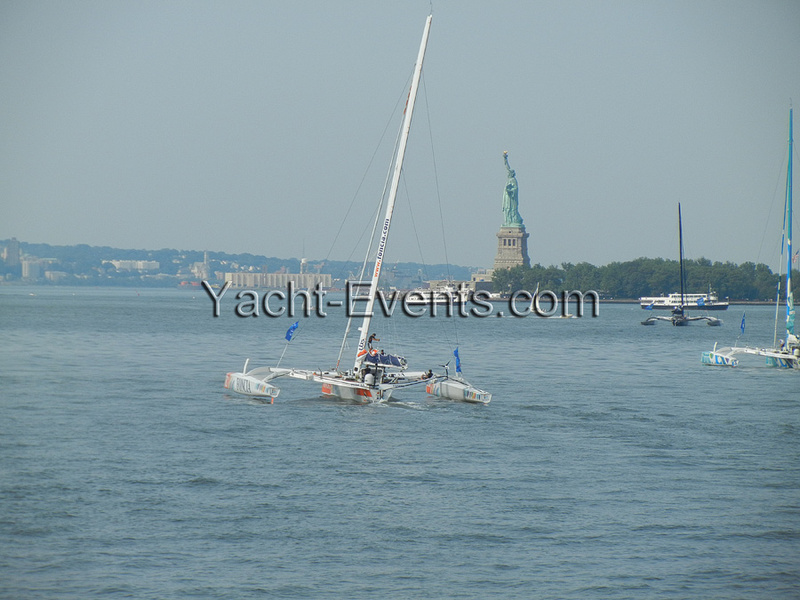 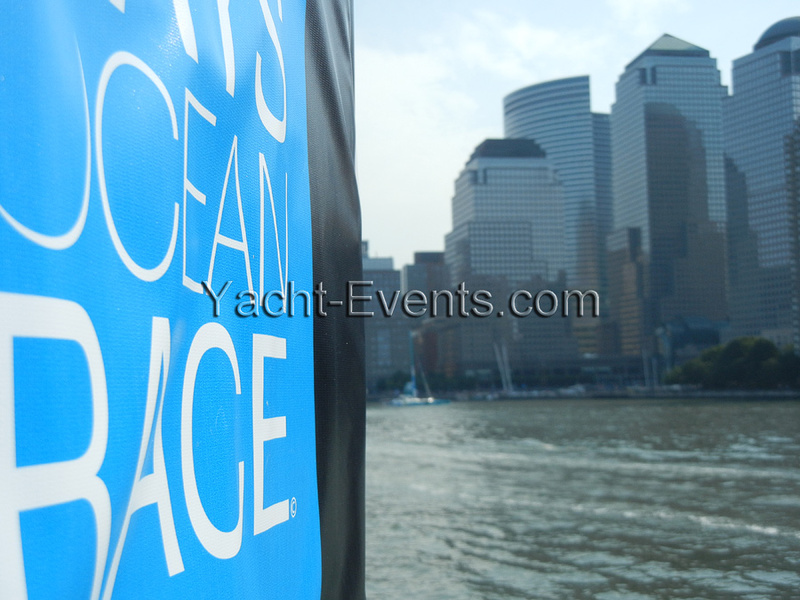 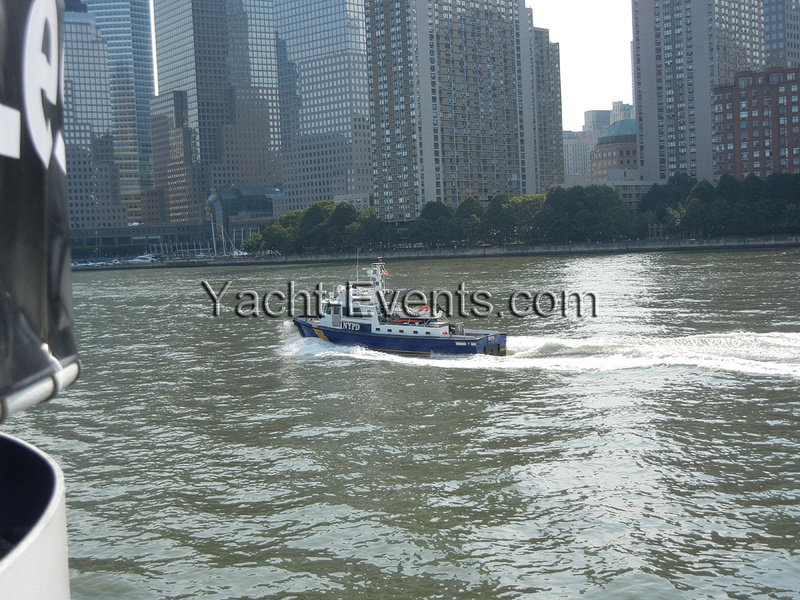 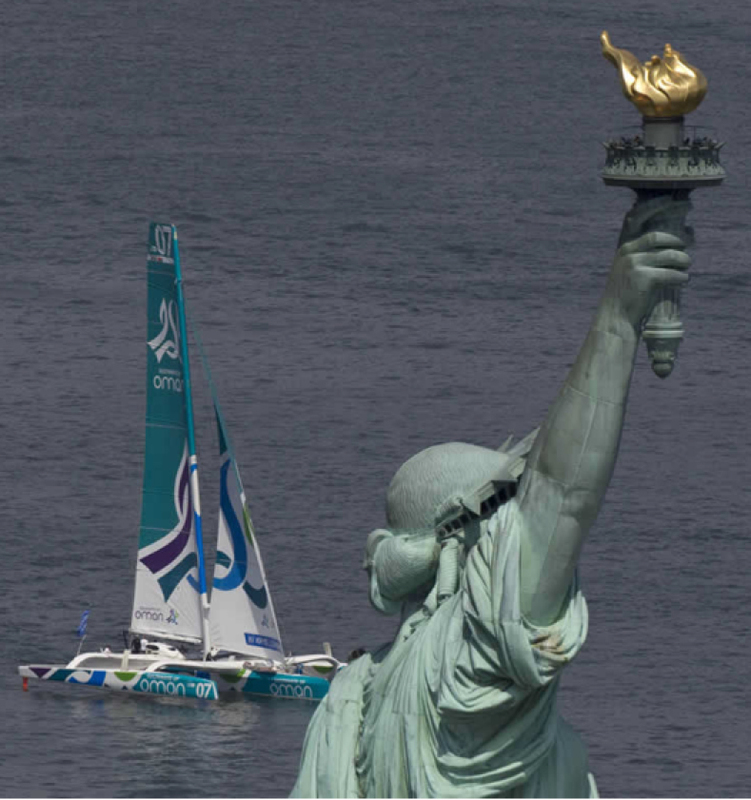 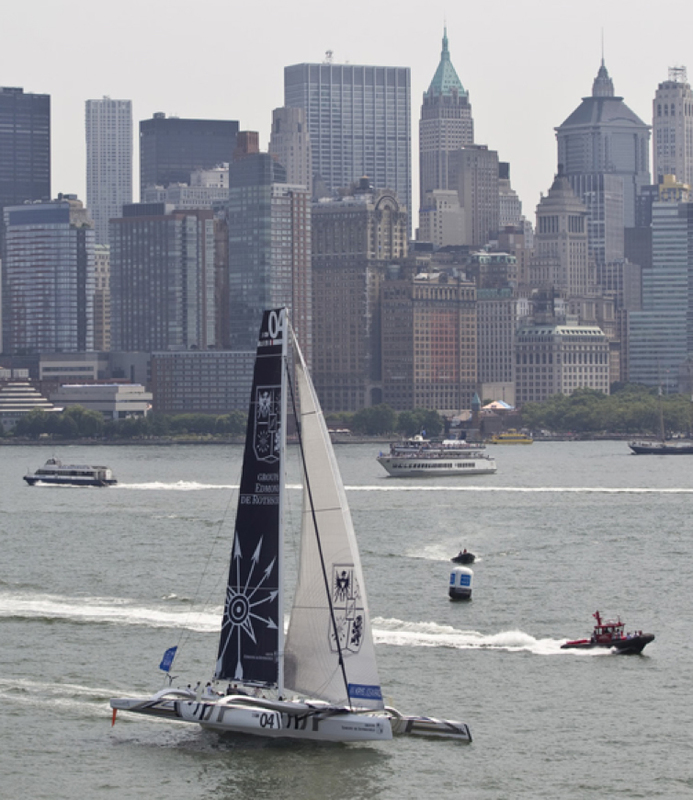 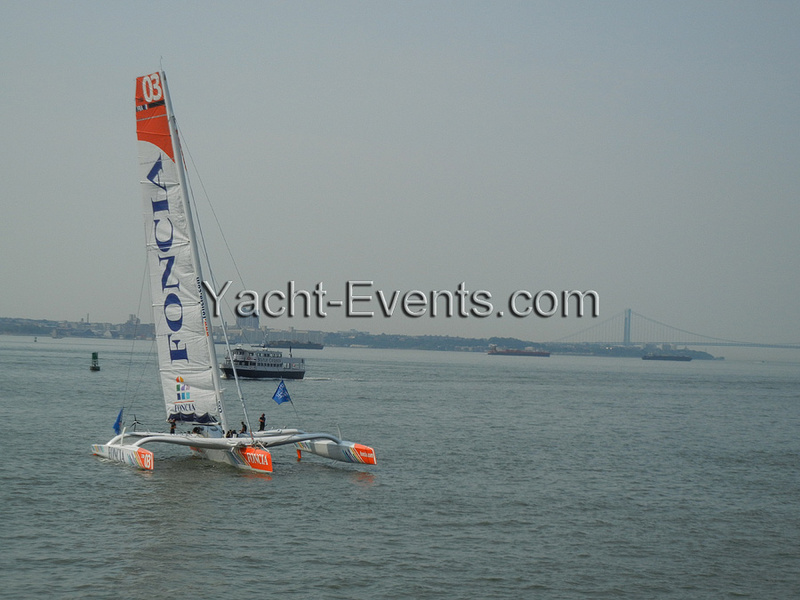 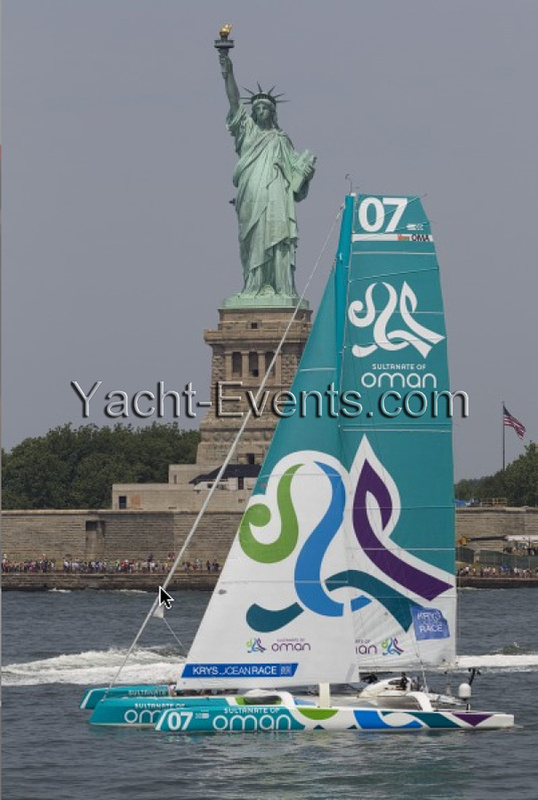 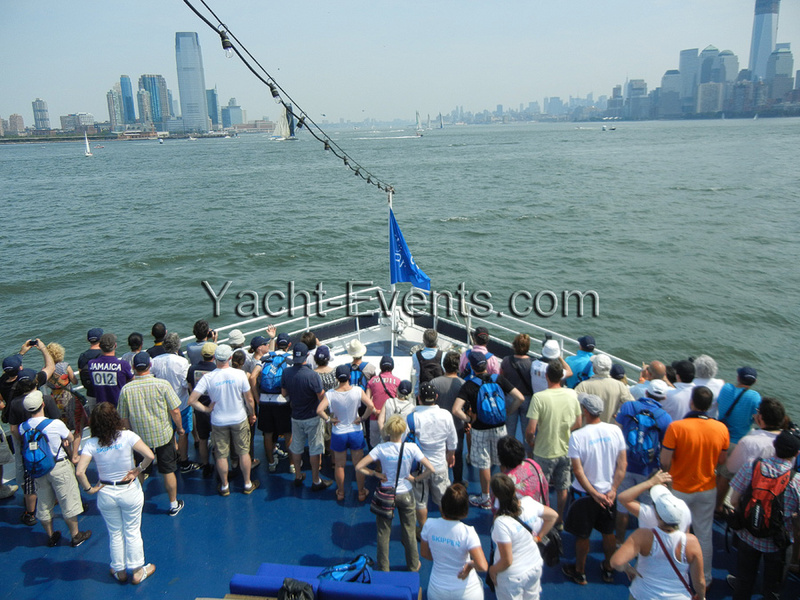 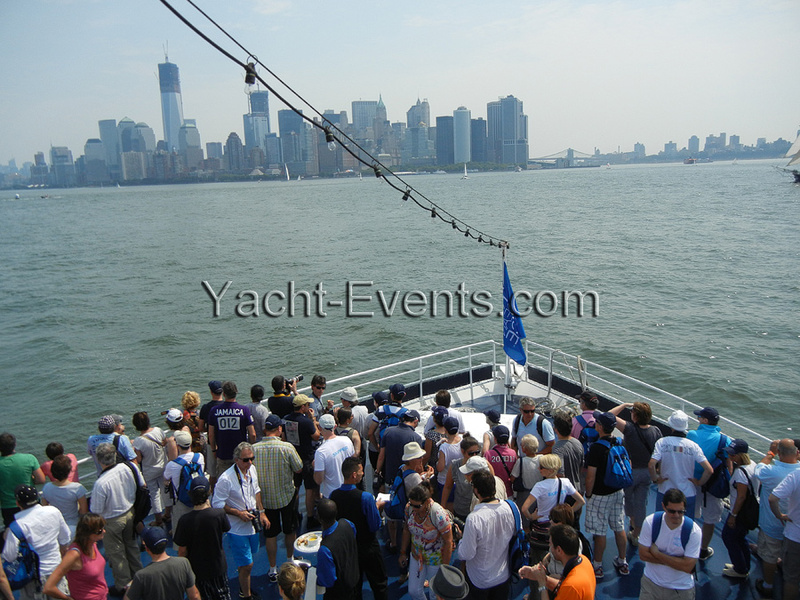 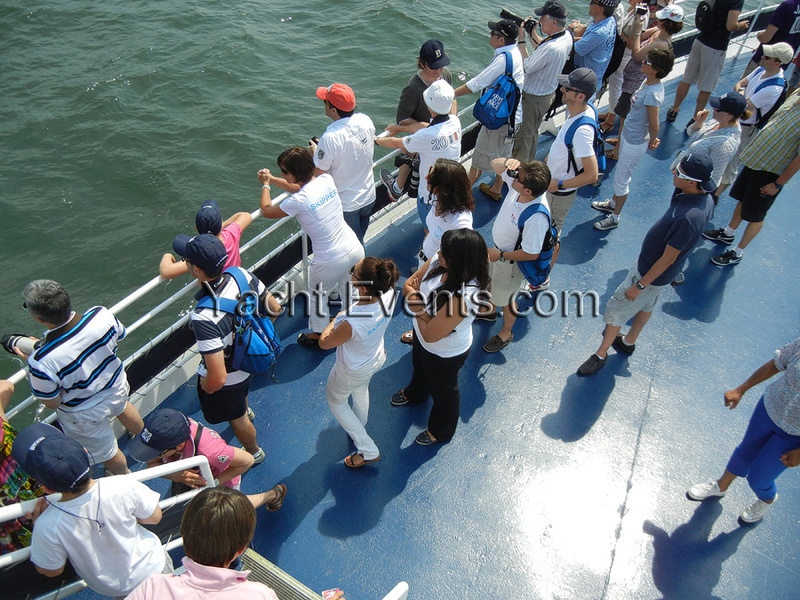 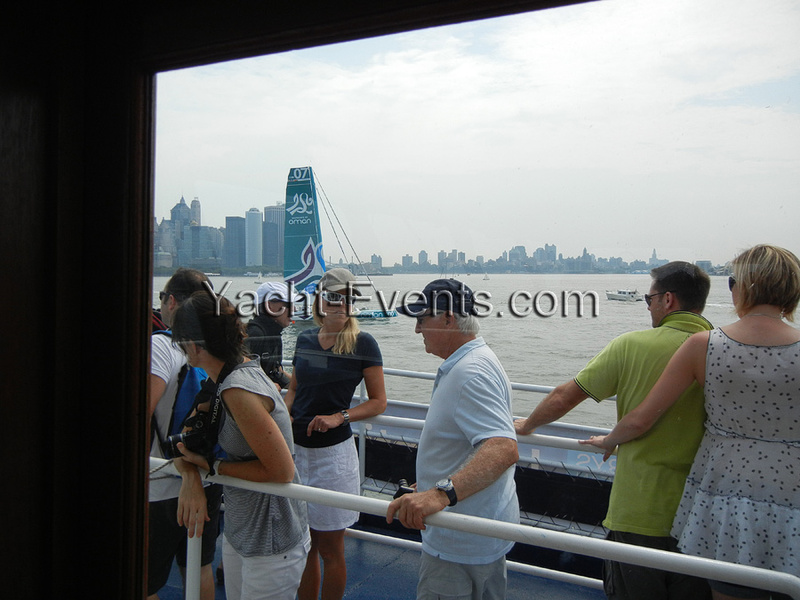 Goodbye New York, hello Atlantic -KRYS OCEAN RACE Begins! 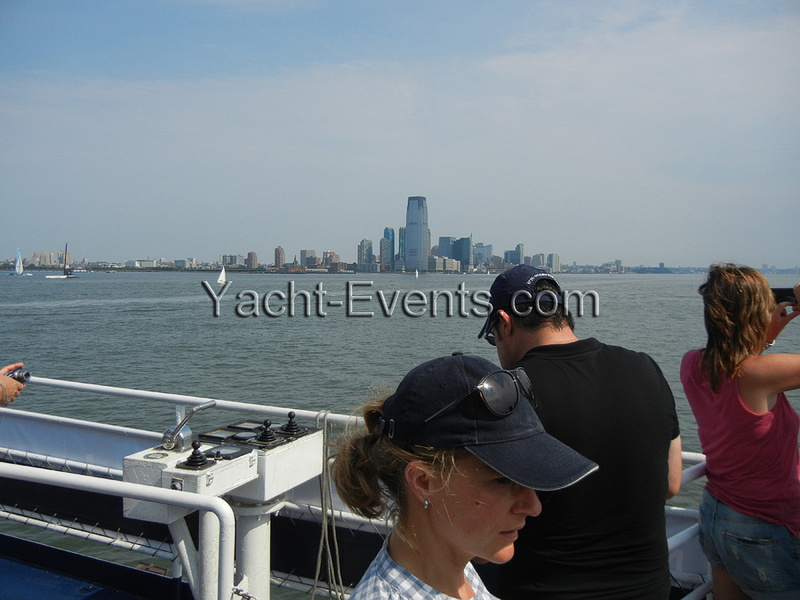 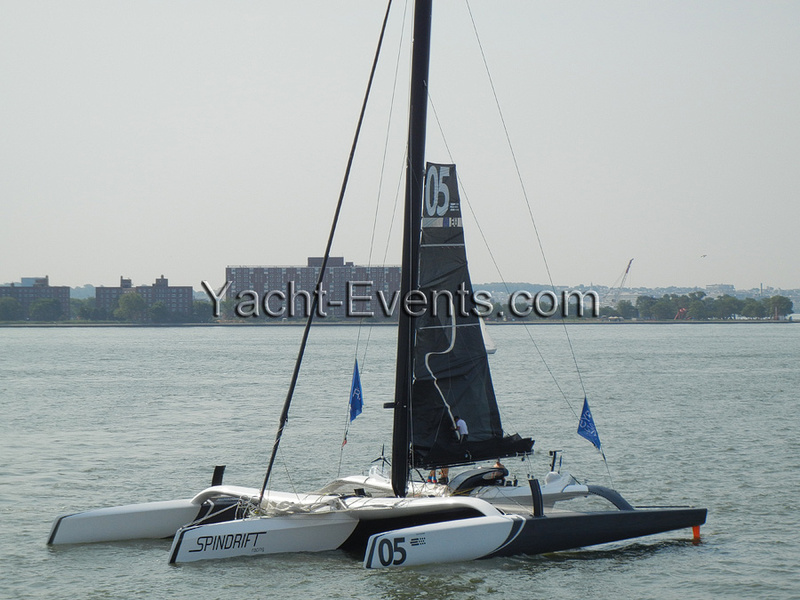 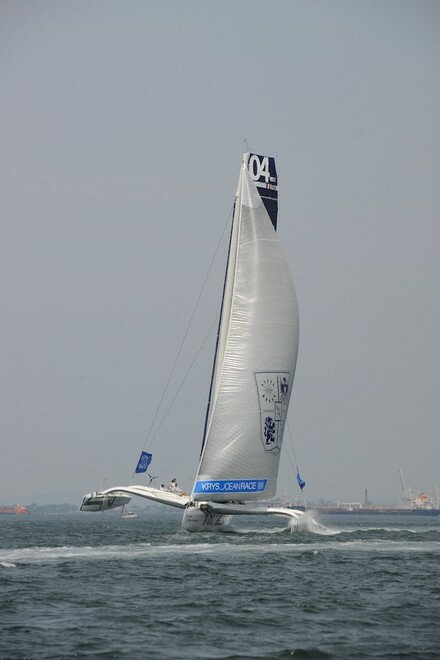 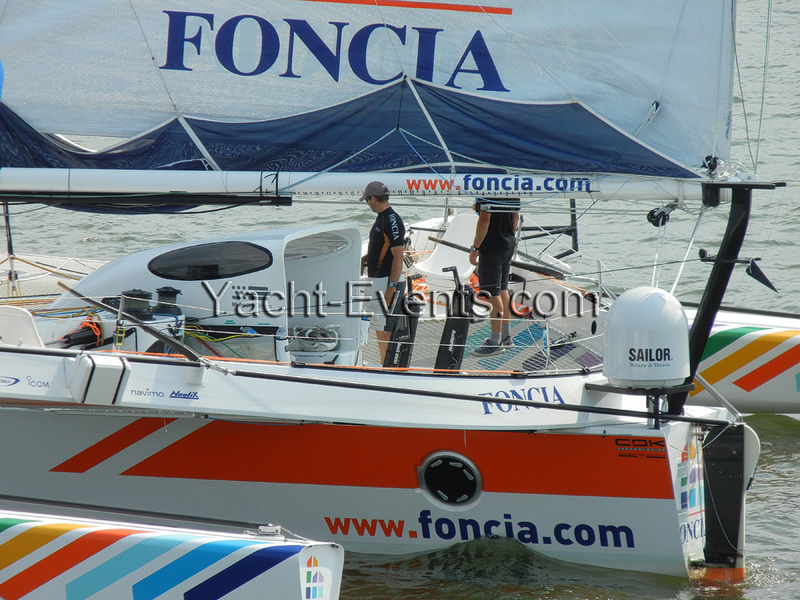 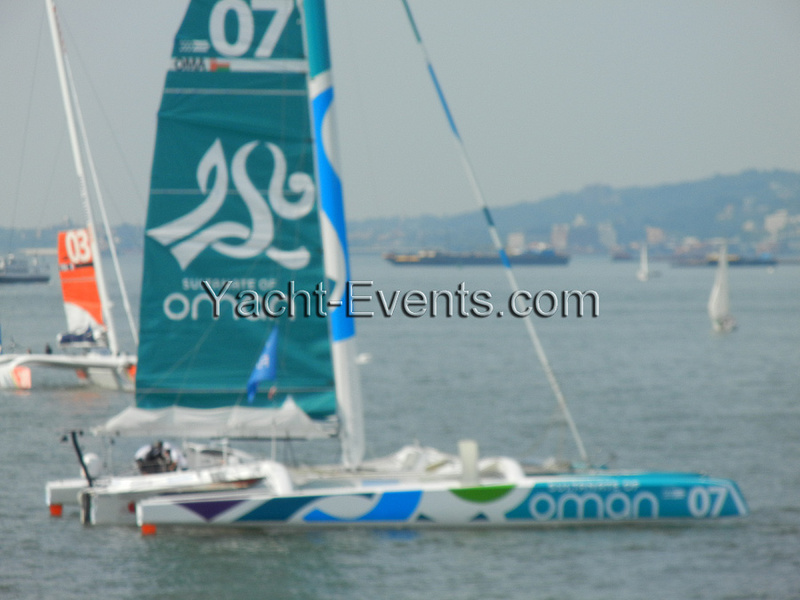 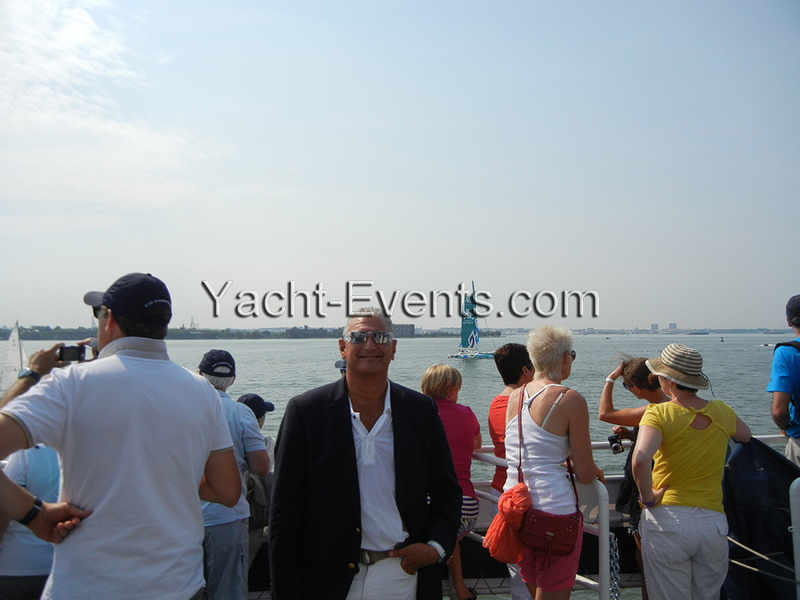 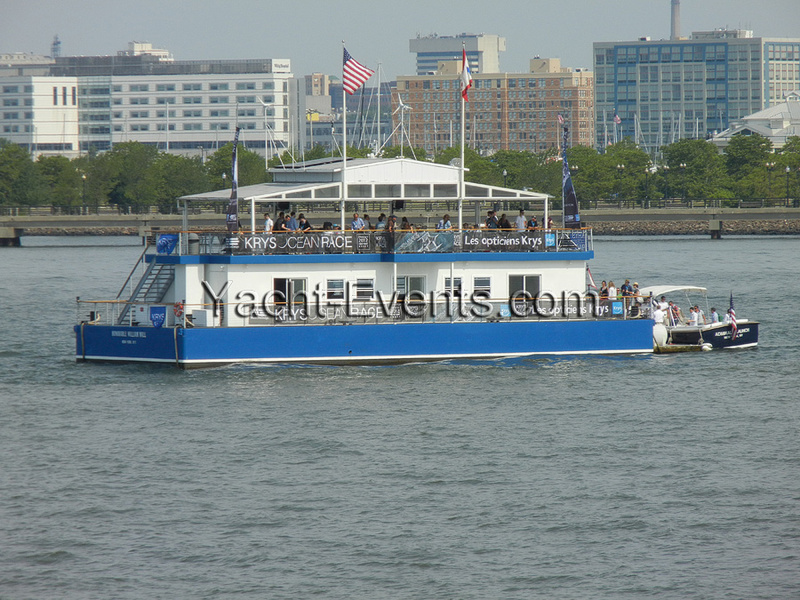 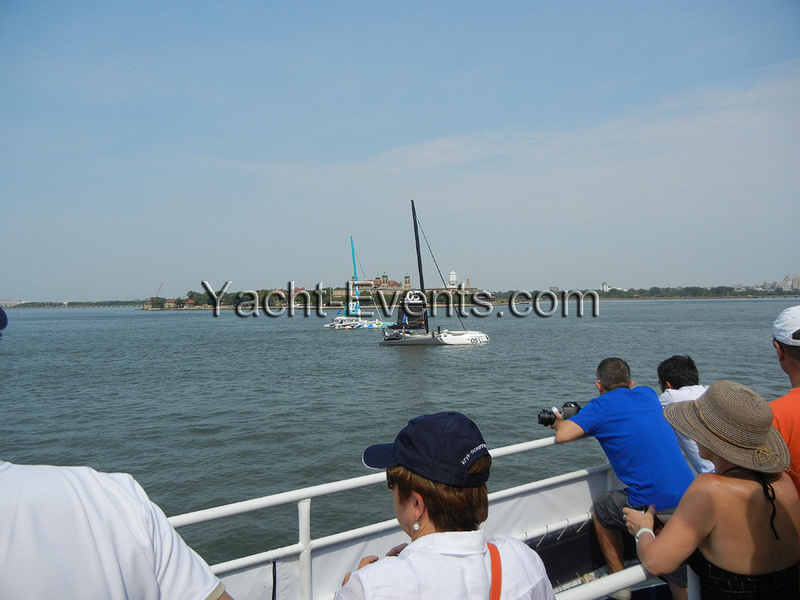 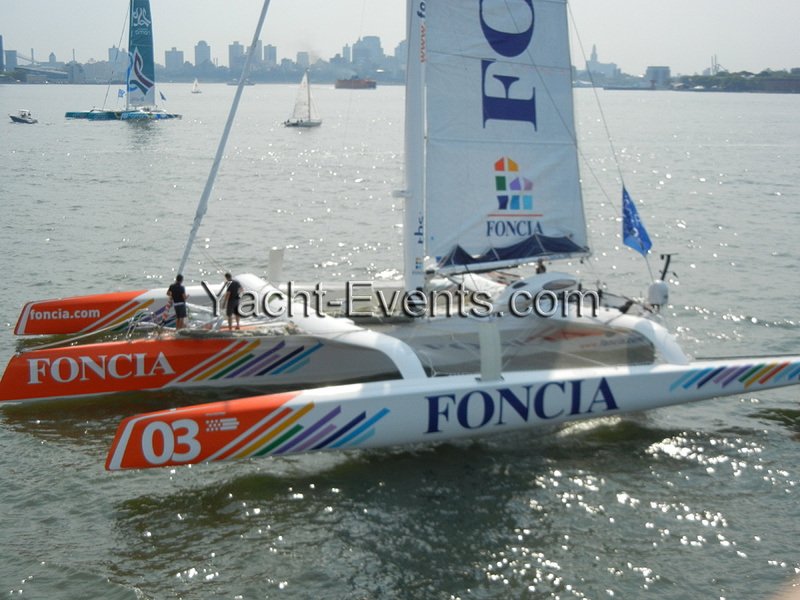 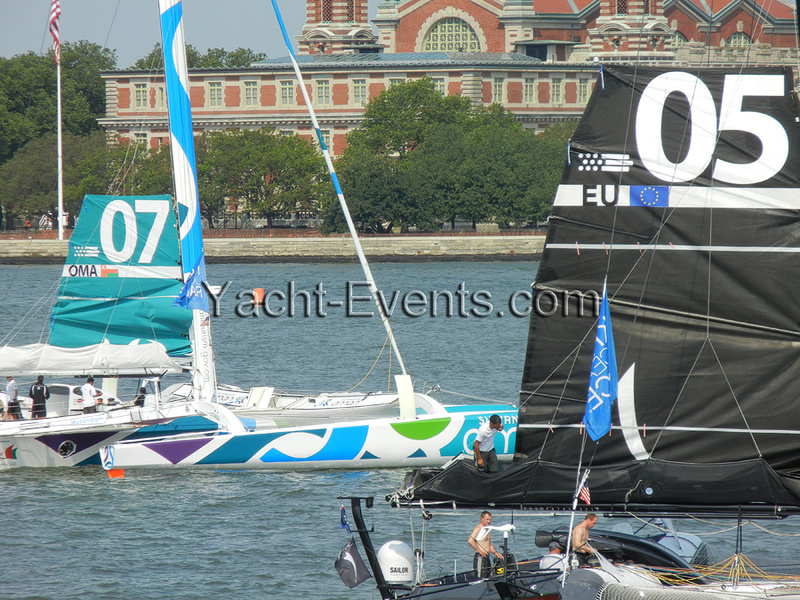 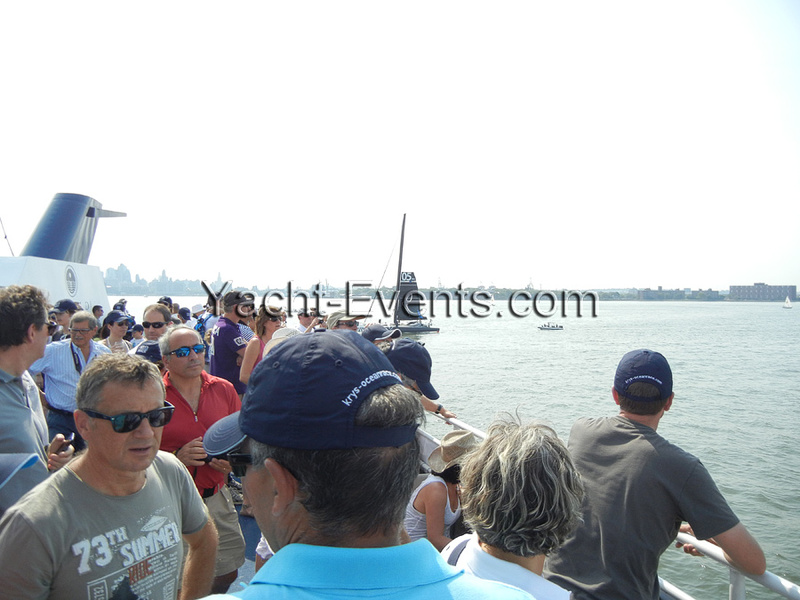 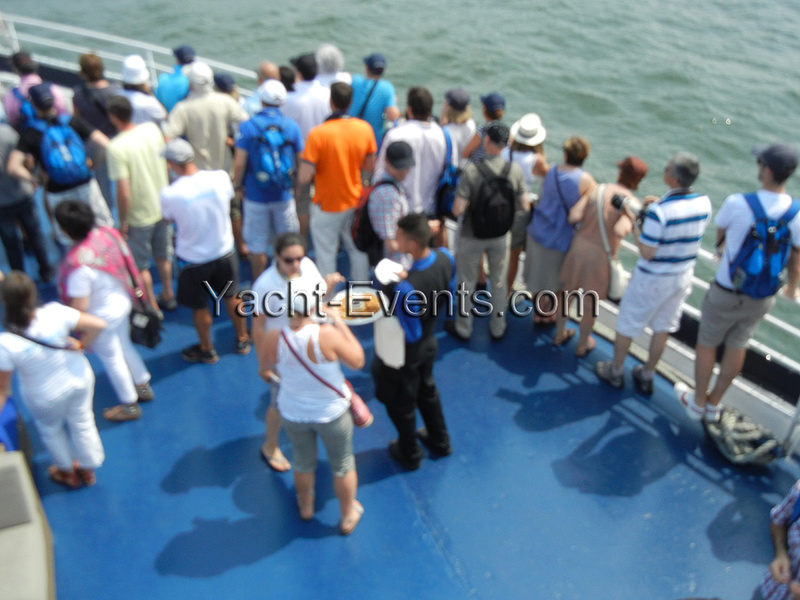 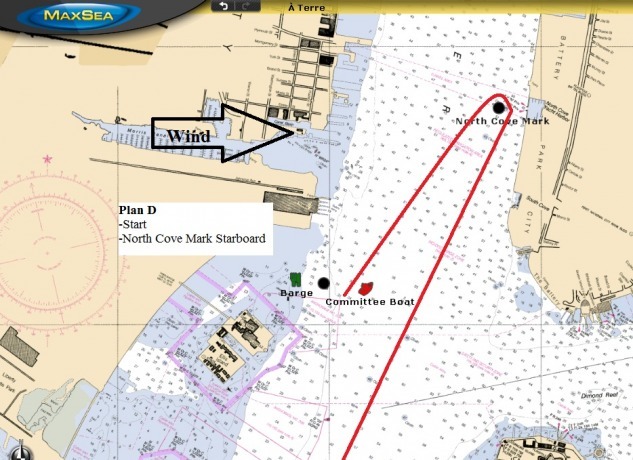 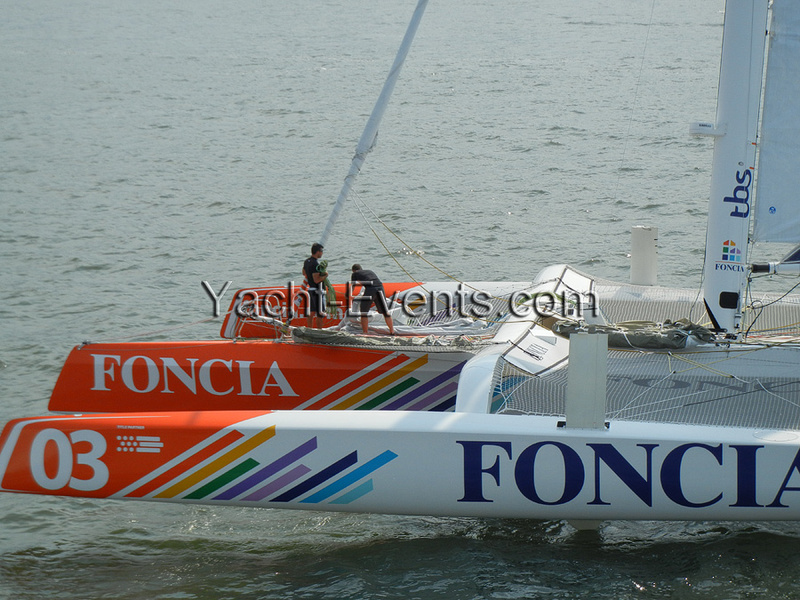 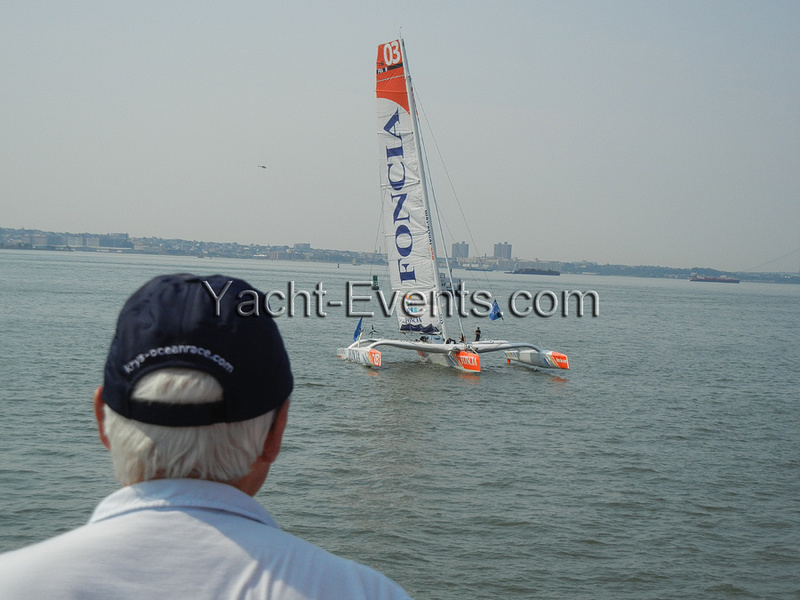 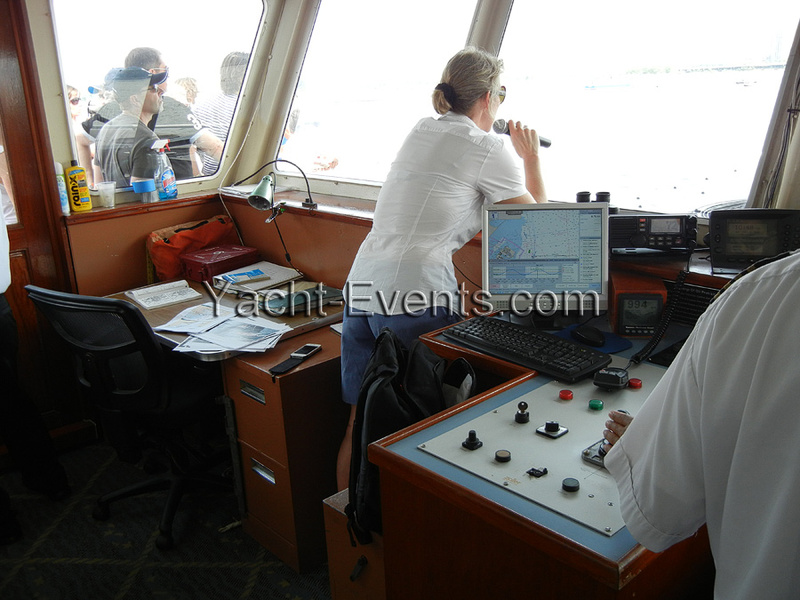 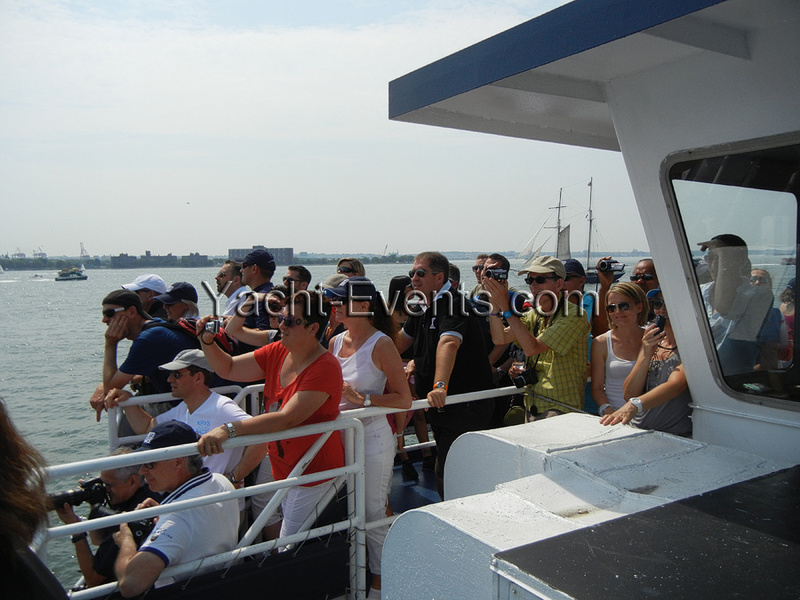 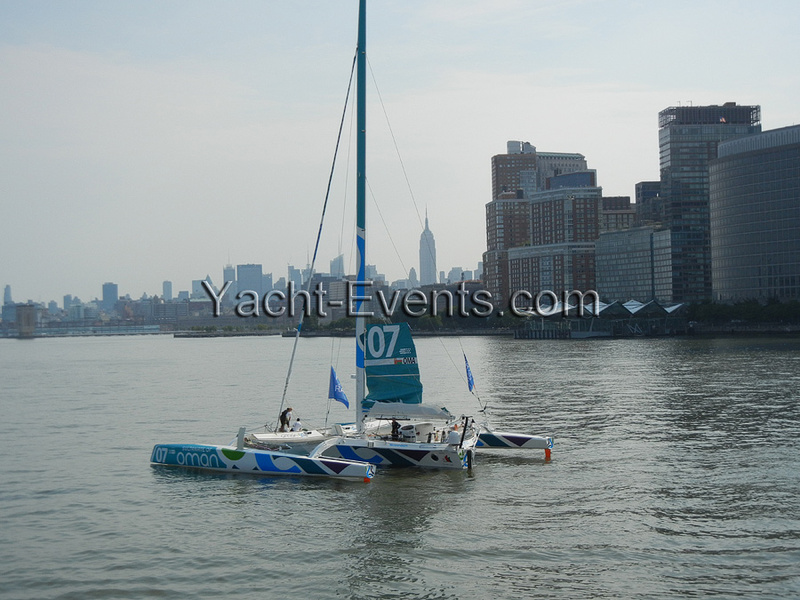 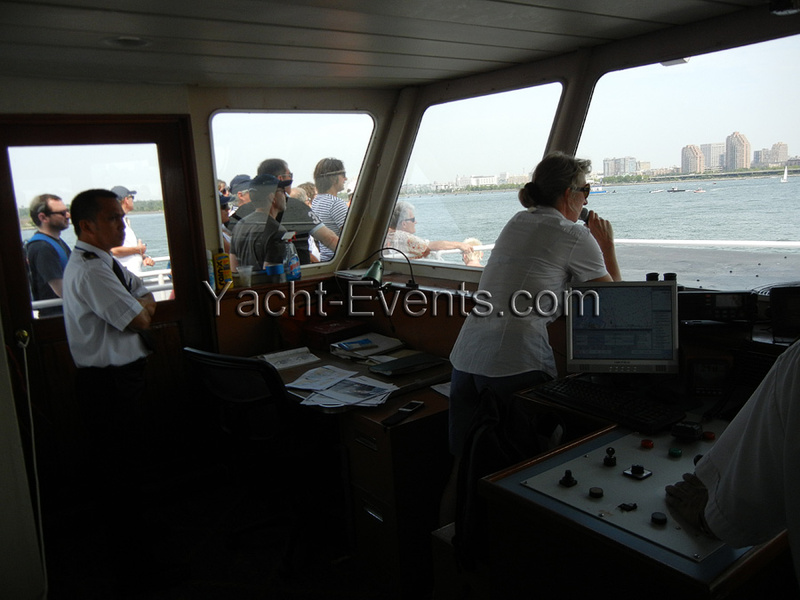 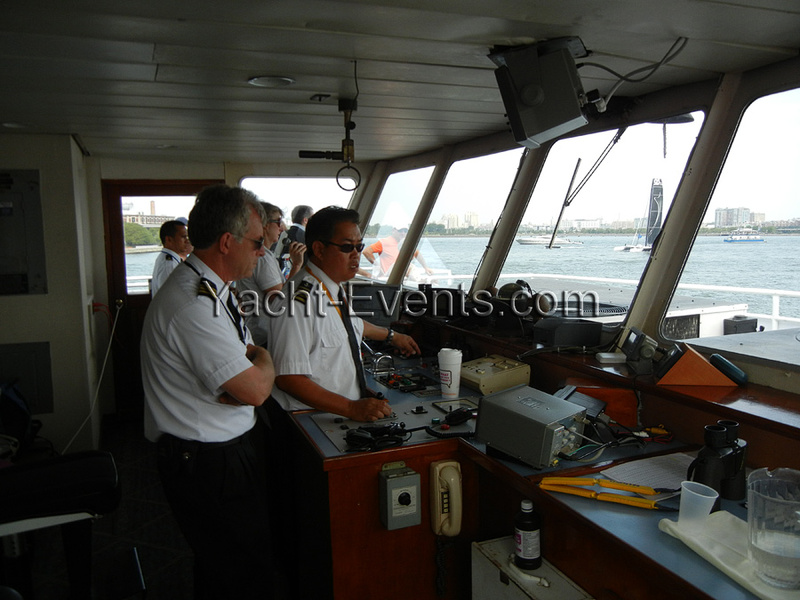 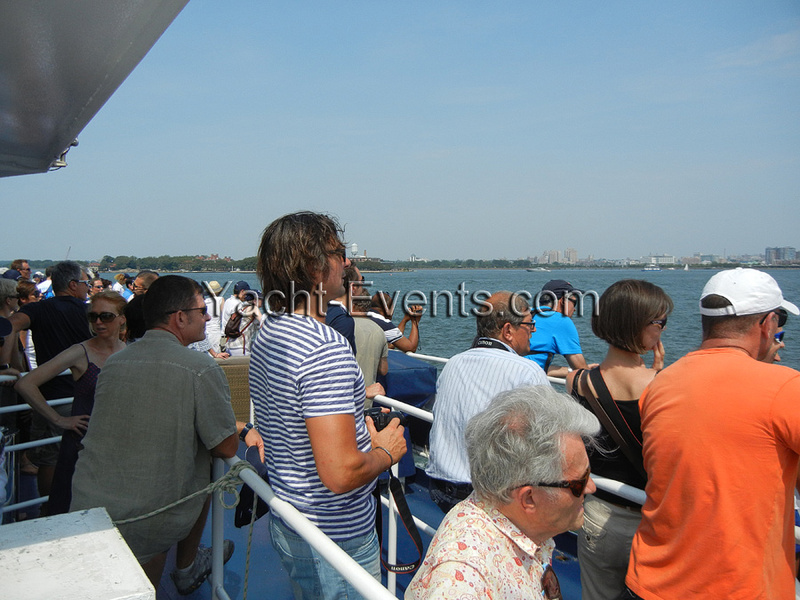 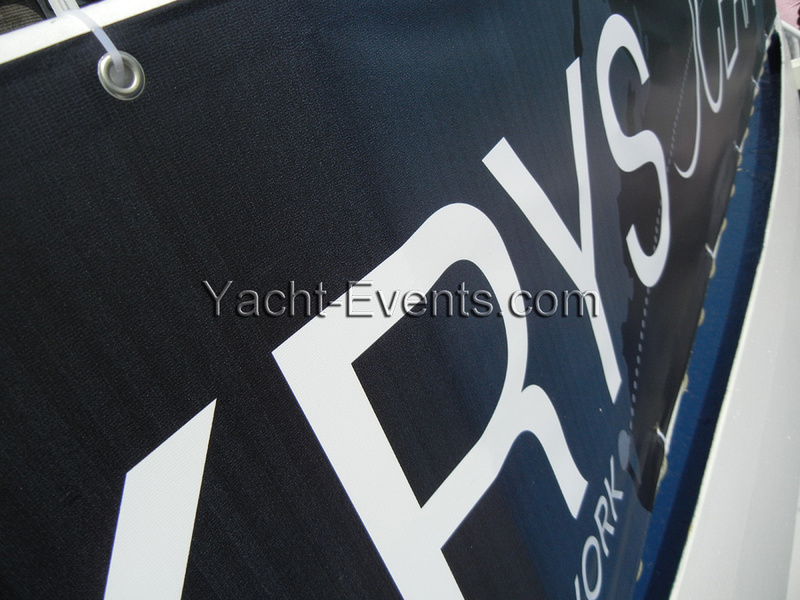 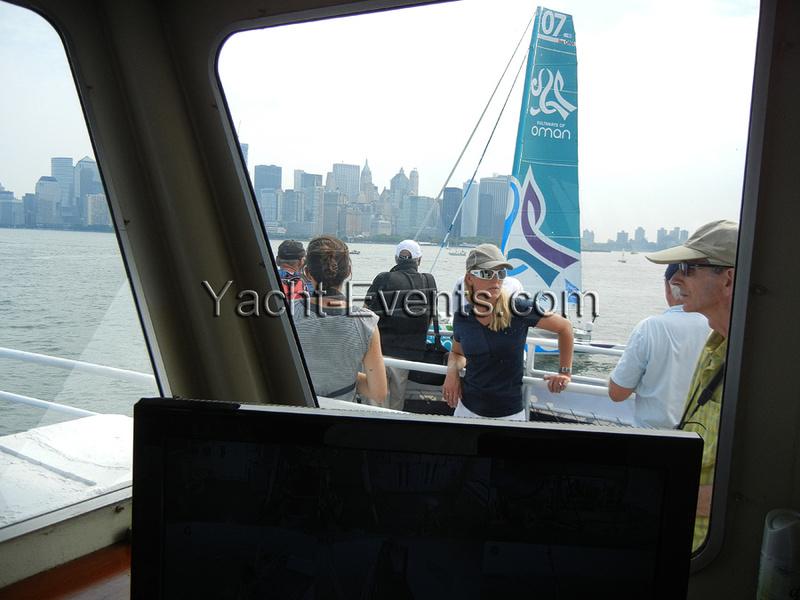 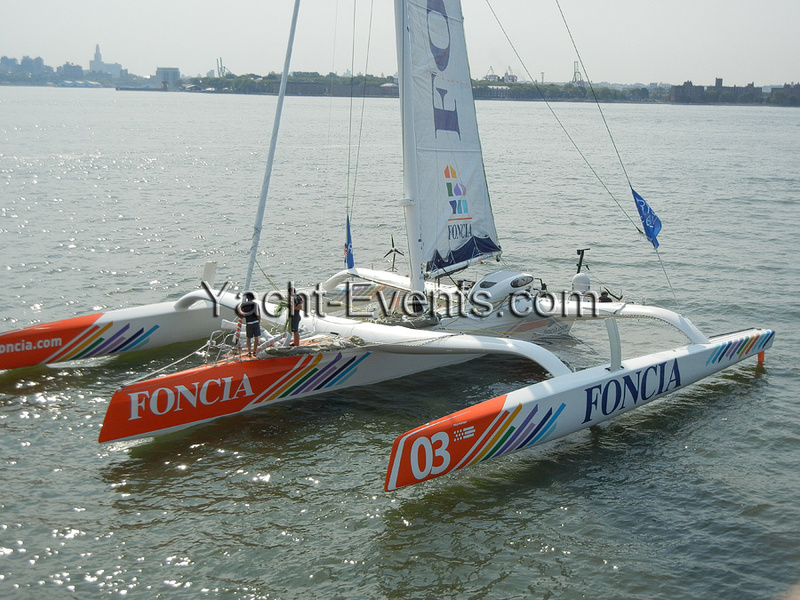 Steven Tanzman – Aboard The Princess yacht for the start of the eastbound transatlantic race. 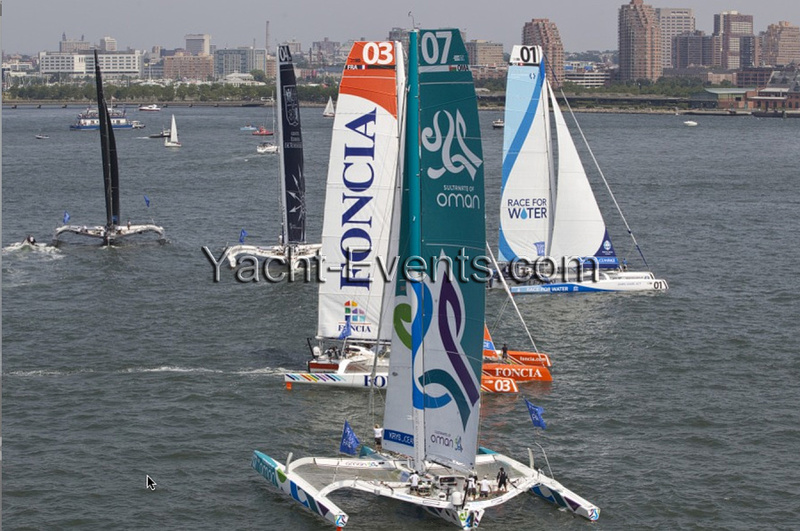 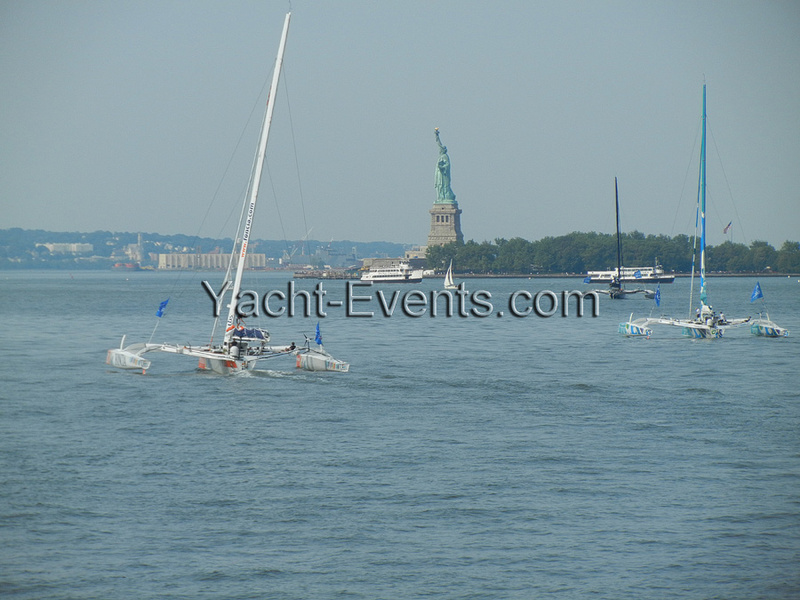 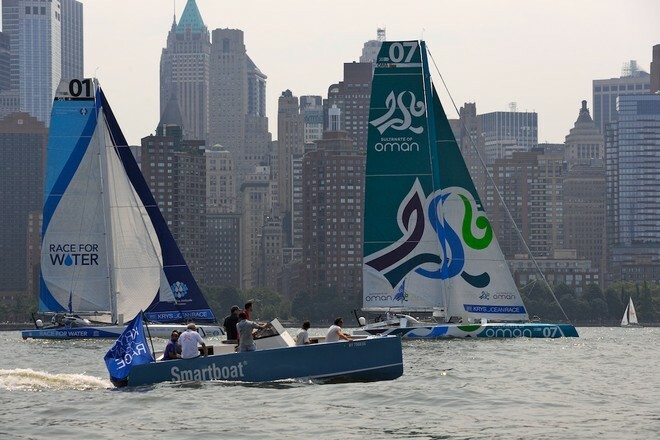 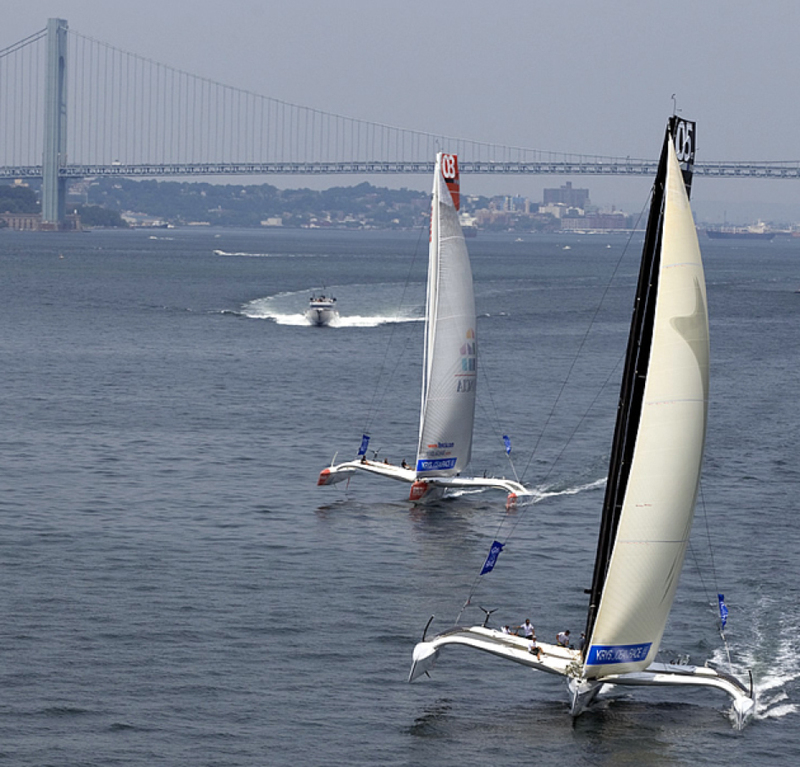 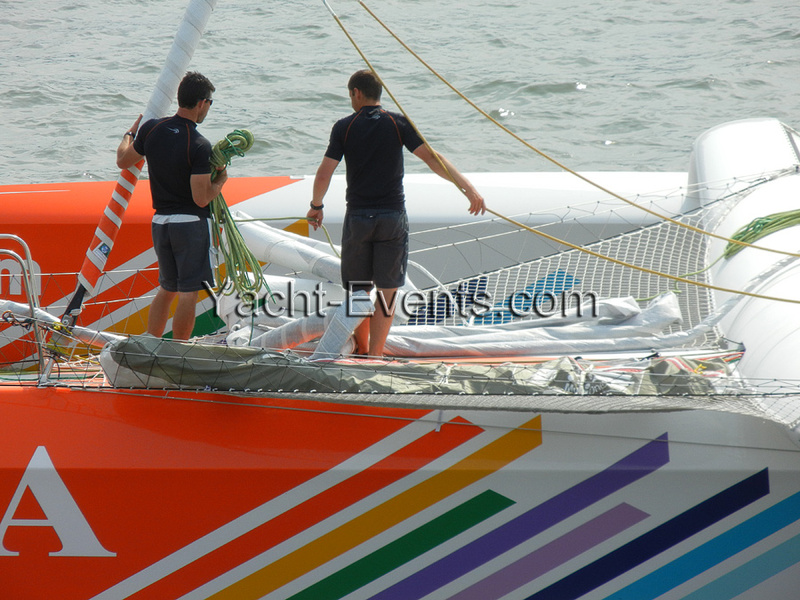 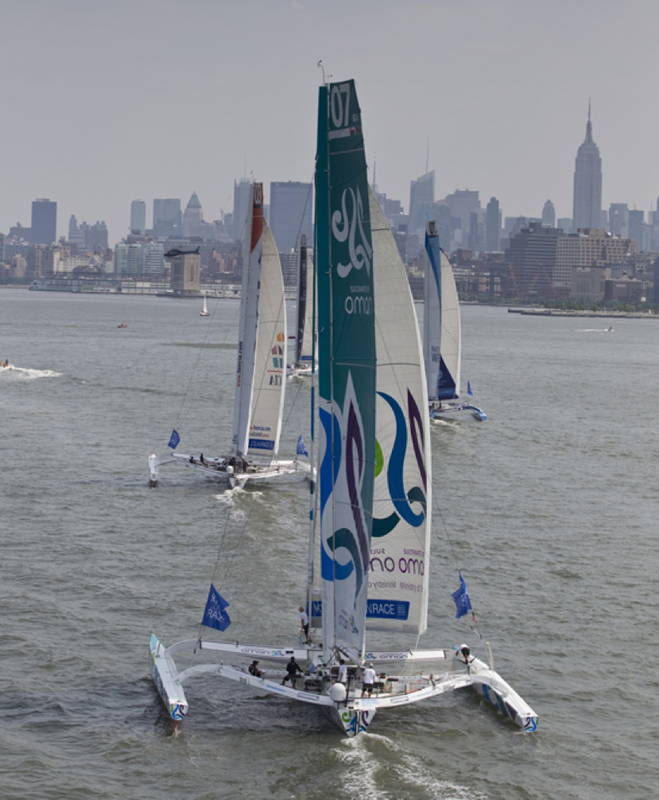 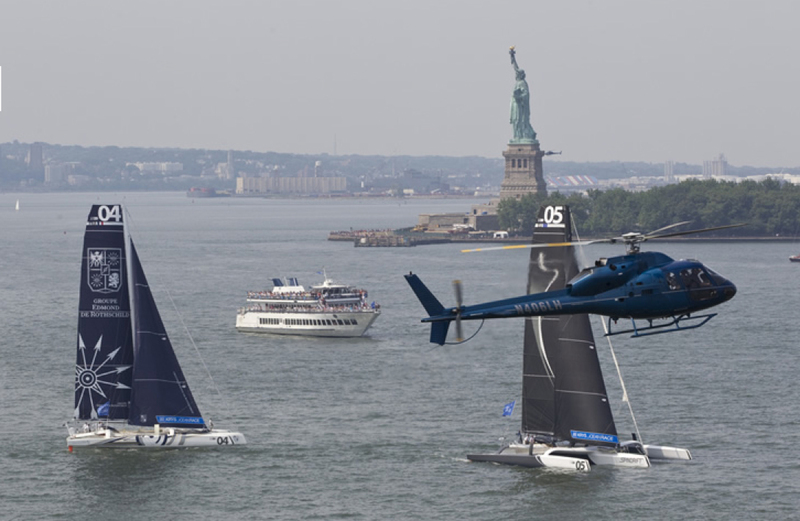 Winds were only light on New York’s hottest day of 2012 so far, with only the occasional puff to send the fleet of five MOD70’s en route, though the strong contrary current made life hard when the giant mulihulls stuck to the water. 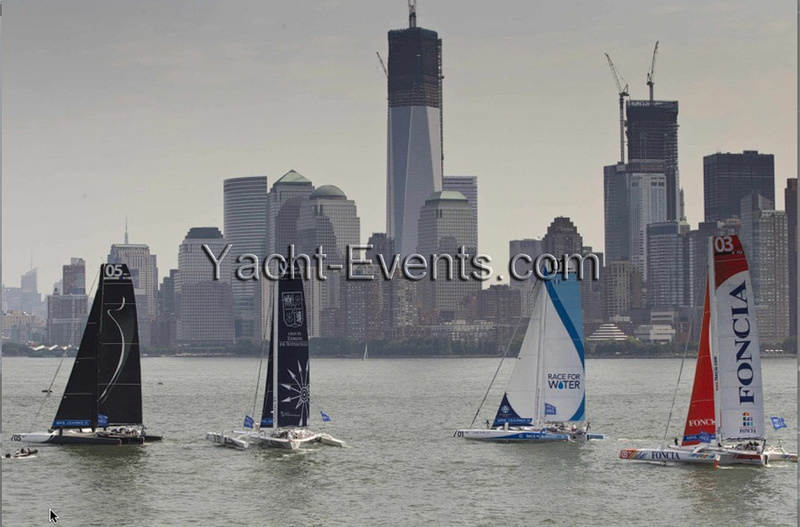 Just as they did on Monday’s dress rehearsal prologue start in Newport, Seb Josse and his well drilled, young crew on Groupe Edmond de Rothschild proved quickest out of the blocks, filling their gennaker headsail first to accelerate smoothly away from the fleet. 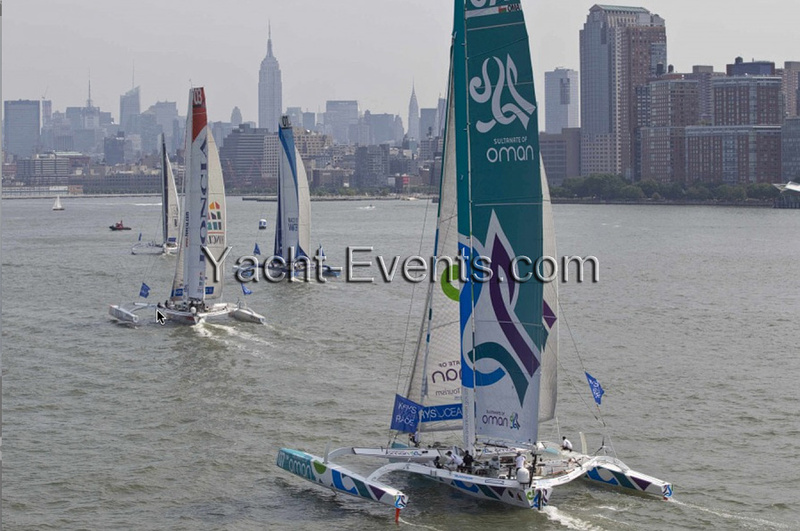 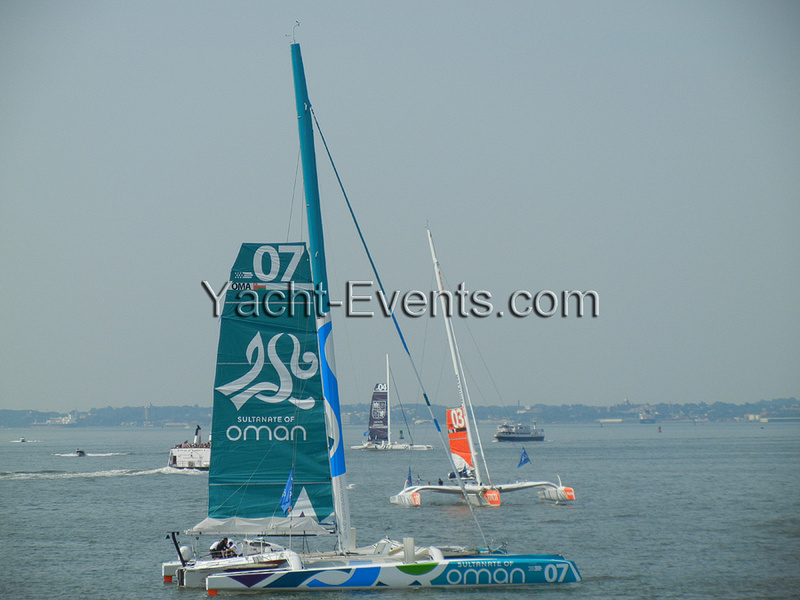 Though they all compressed again at the upriver turning mark, set off the North Cove Marina, Groupe Edmond de Rothschild rebuilt their margin when they stuck to the Jersey shore and slid away, leading Musandam-Oman Sail out to towards the Atlantic. 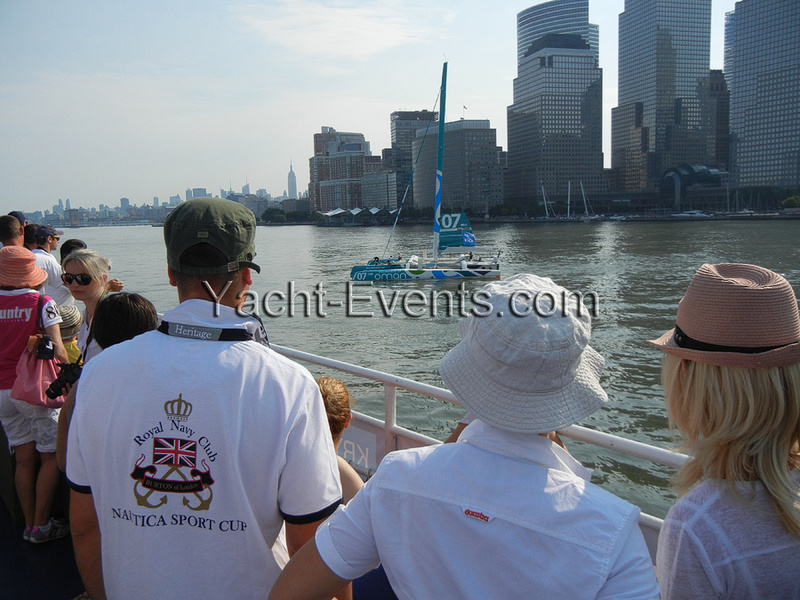 With the Hudson River mirror calm in the early morning, the departure from the quiet sanctuary of Manhattan’s North Cove Marina was one filled with emotion, not only as crew bid their dockside farewells to family, friends and hard working shore crews, but these minutes signified the final end of the three year preparation, planning and execution period for the exciting new MOD70 class and the Multi One Championship. 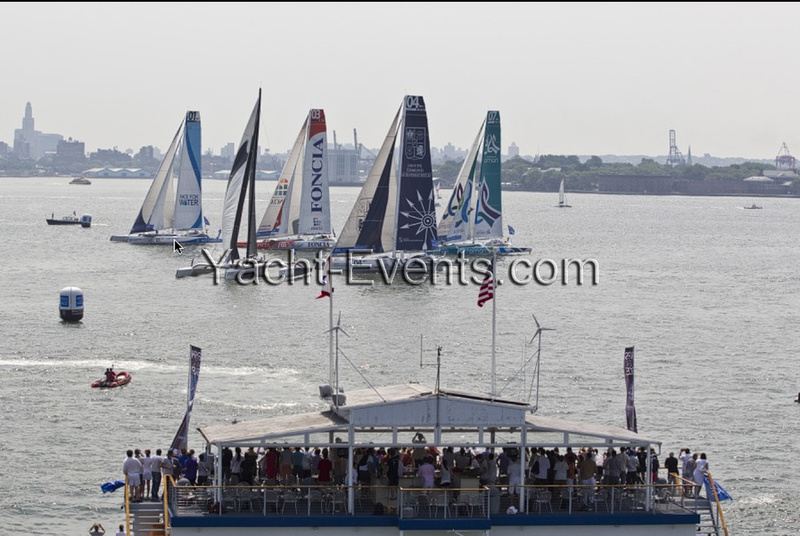 The time has come to go racing. 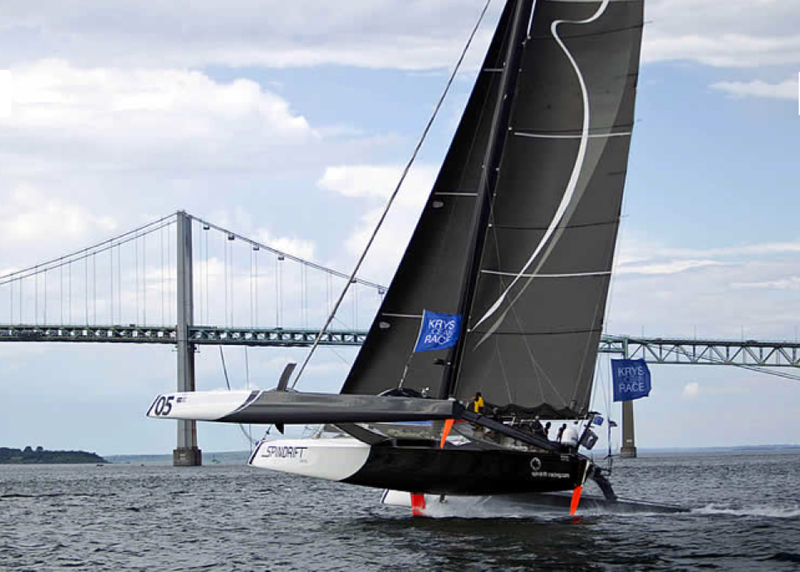 Ahead is a six day sprint across the Atlantic to Brest, which will test the five teams’ abilities to maintain high speeds hour-after-hour. 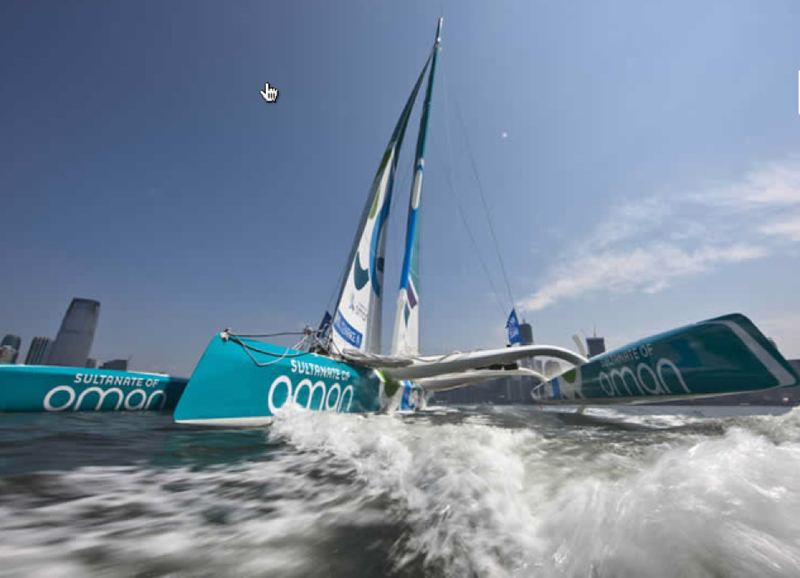 And in the new fleet which is studded with the fastest ocean racers on the planet, all are sure the level will be high, but the question most teams were pondering as they left today was exactly how high?